From an Ohio State release. SAINT PAUL, Minn. – The No. 1 seed Ohio State men’s hockey team could not overcome an early deficit, falling to No. 3 seed Minnesota Duluth, 2-1, in the NCAA Frozen Four semifinals Thursday in Xcel Energy Center. The Buckeyes, who end the year 26-10-5, were making the second Frozen Four appearance in program history and the first since 1998. The Bulldogs will face the winner of the semifinal game between Big Ten schools Michigan and Notre Dame Saturday in the national championship. Minnesota Duluth’s two goals came in the first 3:04 of the game. Louie Roehl tallied at 1:53 and Jared Thomas put the Bulldogs up 2-0. UMD controlled play in the first, outshooting the Buckeyes 17-4. The teams were scoreless in the second. Ohio State had eight shots in the period, with UMD putting six on goal. The Buckeyes drew within one at 9:27 of the third. With the Buckeyes on the power play, Wyatt Ege’s stick broke on a shot. The puck stayed in the zone, with Dakota Joshua helping maintain possession, and Tanner Laczynski picked it up off the scramble and scored from the high slot. Ohio State skated with the extra attacker with about two minutes remaining but could not get the equalizer. Shots were 8-5 in favor of OSU in the period. Ohio State was outshot, 28-20, in the game. Buckeye goalie Sean Romeo had 26 saves in 57:48. UMD goalie Hunter Shepard had 19 stops in all 60 minutes. Romeo’s 2.06 goals-against average and .927 save percentage are both the third-best marks in program history, while his 22 saves are tied for second in a single year. The Buckeyes blocked 16 shots in the game, led by Ege and Matt Joyaux with three each and Sasha Larocque and Gordi Myer with two apiece. The Buckeyes converted 1-of-4 power play chances, putting eight shots on net, and killed both Bulldog opportunities with the man advantage. The Buckeye penalty kill leads the nation, stopping 89.4 percent of its opponent chances (the best since at least 1998-99). Ohio State finished the year 38-for-159 on the power play (.239), ranking in the Top 10 in the NCAA. Laczynski ends the year with a team-high 47 points on 17 goals and 30 assists. Mason Jobst was second with 43 points, including a team-best 21 goals. Ohio State’s defense limited opponents to 2.07 goals a game on the year, ranking third nationally and the lowest team goals-against average in program history. The previous best was the 2.21 goals allowed per game posted by the 2002-03 squad. The game ended the career of six Buckeye seniors – Matt Joyaux, Christian Lampasso, Kevin Miller, Janik Moser, Luke Stork and Matthew Weis. 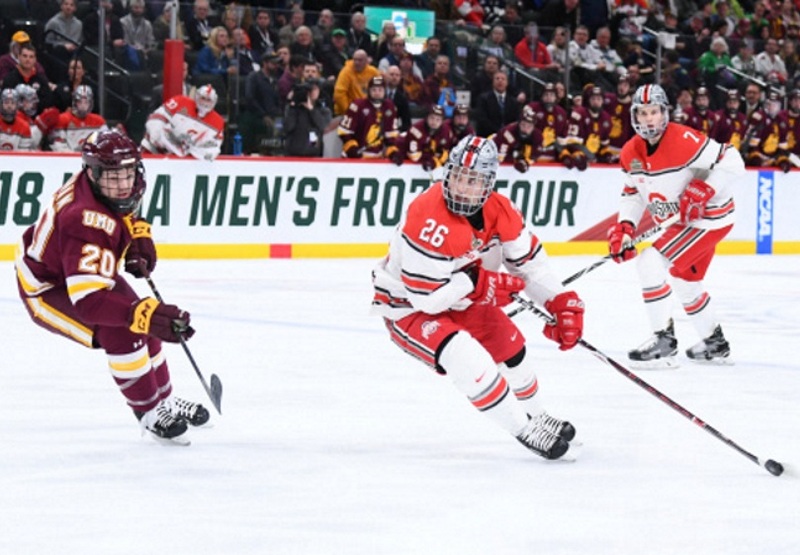 Minnesota Duluth – 2, Ohio State – 1MODERATOR: We’re joined by Ohio State. Coach, an opening comment. COACH ROHLIK: Well, tough way to start a hockey game against a really good hockey team. We dug ourselves a hole. But I couldn’t be more proud of my group. They never quit, like they have all year, right through the end, even believing with one point, whatever is on the clock we could still score. I’m just proud of our university, proud to be on a big stage like this and really proud of my guys. Q. Mason, why was it so difficult for you guys to generate what you would call quality shots out there at least for the first two and a half periods? MASON JOBST: They did a really good job with their sticks and blocking shots. Obviously it wasn’t the start we wanted. And they just did a good job of clearing out the front of the net. Q. That rush, they came with it — at you guys early. What was it like to be in amongst that and what did you see from that point on what you guys kind of tightened up. WYATT EGE: It was tough on us. They had two-man forecheck right away. It kind of shocked us a little bit, but once we got into it we were good. Q. Either of you guys, talk about the game that Hunter Shepard had in front of you guys. You had good quality chances as the went on but he was up to the challenge. MASON JOBST: Goaltender played well. I still don’t think we got enough traffic in front and the quality chances we wanted. But you’ve got to give him credit; he only let up one goal. WYATT EGE: Same thing. We didn’t have a lot of traffic in front. He was able to see a lot of everything that’s why we didn’t score. Q. How do you put the year in perspective, Mason and Wyatt? MASON JOBST: Just building off what Coach said, I’m proud of the guys. They talk about being a leader and it’s really easy during the good times, and it’s a great group of guys and they made it easy on me all year, one of my favorite teams I’ve been on my entire life, and I love these guys. And I’m proud of them. First time in 20 years, it’s quite the accomplishment. Obviously it’s not where we want it to be at the end result. But I love them. WYATT EGE: Yeah, I think we were a close group from the start. Starts in the locker room and obviously you guys saw it on the ice. We had a really good season. Q. The stick on the power play, was that your stick that broke? WYATT EGE: Yeah, it was. Q. That was amazing. It’s nice to come away with an assist on that, but what happened, it just gave out? WYATT EGE: Yeah, it just gave out. Really lucky to get an assist on that, let alone have the puck stay in the zone for our guys to keep battling, but it was good. Q. Slick passes weren’t working and that worked? MODERATOR: Thank you. Questions for Coach. Q. Could you talk about the start? Obviously it wasn’t the start you wanted. Did you feel maybe you guys were tense? Looked like they just kind of drank from a firehose a little bit. COACH ROHLIK: Absolutely. For whatever reason — we might have did that one other time and that was in the Big Ten championship game against Notre Dame. And again you gotta tip your cap to Duluth. But our guys felt we were on our heels right away. And again I couldn’t have predicted that. We probably had the best last 10 days of practice that we’ve had on and off and really felt like we were focused and ready to go. But you get smacked in the face like that early it wakes you up. Q. Coach, I know it’s tough to think about this right now, but can you reflect on not only the great season you guys had, but on the season that the women’s hockey team and what it means to Ohio State for both schools to be able to make the Frozen Four like they did this year? COACH ROHLIK: For me, like I told our guys, I’ve been coaching, what, 27 years, this has been the best group I’ve been around. Easiest group to coach. I think there was one day all year I had to get on in them in practice, but other than that you could see what it was like. And to accomplish what we did, they were on a mission from last year. We had a case in the NCAA Tournament. These guys are the ones that steered the ship. I was just there guiding it. And you’ve got to pinch yourself when you’re around a group like that. And it’s just too bad we came up a little short. I’m just so proud of our university, our hockey programs, and the dean did an incredible job with our women’s team. To walk away and have both programs in a Frozen Four speaks volumes of where the hockey is at right now. Q. Your players talked about it a little bit, about not generating much in front of Shepard. But the UMD defense seemed to keep you guys on your heels all night. They played pretty tight. COACH ROHLIK: You know what, they play a lot like we want to play. It’s not just their defense. You could see how hard their forwards come back, what we call reload. They get above the puck all the time. And, again, which gives defense confidence that they can be up and close the gaps because their forwards are right there. So they use their speed. They take away time and space. They haven’t given up a lot all year and you saw it again tonight. They just don’t give you much because, again, they use their speed. They take away time and space. Their D get a lot of help from their forwards coming back. Q. After you all got down, it was fairly animated over there on your bench. But basically what was the message to your guys? COACH ROHLIK: At that point, don’t play to lose. You know, let’s just go out there and play to win; whatever happens happens. We’ve come too far. And our guys had a belief even after two periods, even in between a second and third, alls we gotta do is get the first one. Let’s get the first one. And again right to the buzzer our guys believed we could win. And that’s just a credit to our team and it’s our culture and it’s our mentality. Obviously Duluth played a great game, and at the end of the day they made one more play than we did. Q. When you go down early like that, as a coach, how important is it to sort of snap your team back into it, to get them refocused right away going into the second? COACH ROHLIK: Yeah, it’s certainly, again, like I said before, we haven’t seen that happen to us all year. I don’t know what it was, 3:04 into the game, we were down 2-0. So again we kind of looked like we were in quicksand even after that a little bit. And we just managed to get through that first period almost and then reset. We talked about resetting a lot on the bench. And I think as the game went on we started to get more comfortable, and you saw it in our team. Q. Just talk about what Sean Romeo meant to you guys tonight and throughout the whole season? COACH ROHLIK: He’s been incredible all year. Obviously a tough start and most guys might fold their tent but not Romes. He stood in there tall for us. At the end of the day we’ve got to score more than one to win. So he’s been incredible. When you see a kid like that do what he does on the ice and you see the award he won yesterday, that speaks volumes of what Sean Romeo is all about. Q. Last couple times this tournament’s been held here, a Minnesota team has won it. Now the Bulldogs are headed back to the national championship. Do you sense a home-ice advantage for Minnesota teams here at all? COACH ROHLIK: Well, it is in Minnesota. And there is a lot of Minnesota fans here. But you know what, at this point it was great. I mean, our guys enjoyed it. We loved playing on the road. Great atmosphere, great venue. I mean the Xcel Center put on a tremendous show. We’re proud to be a part of it. When you’re Minnesota-Duluth and you’re couple hours away and you’re playing here, certainly it’s going to be a home-ice advantage. But I’d take it every day of the week if we had an opportunity to play it again.